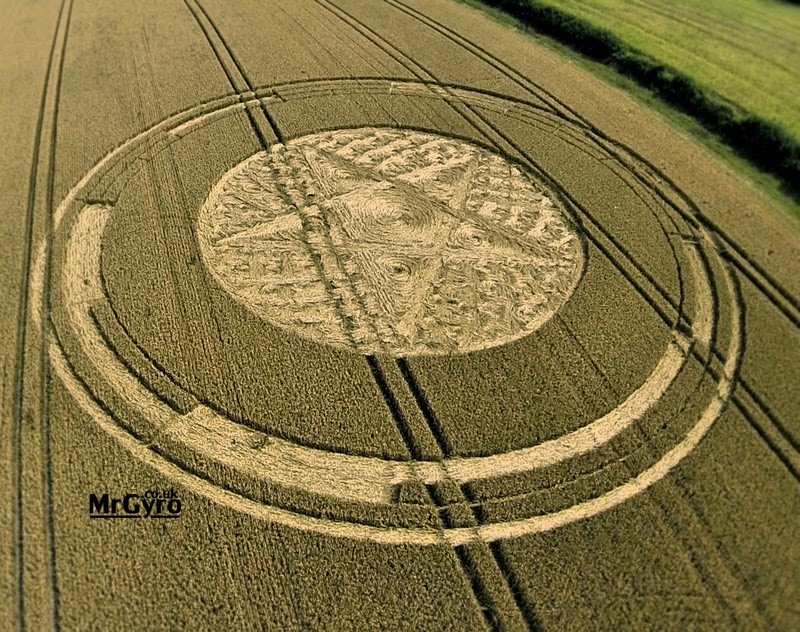 This entry was posted in 2016 Season, farmers, Report A Crop Circle Formation on August 10, 2016 by admin. Charles Mallett interviews former RACCF admin Krsanna Duran in an attempt to peep behind the curtain of “The RACCF/Pyrka Phenomenon”. Despite our click-bait header it must be said that this video is long on duration, makes for cheek-numbing viewing, and won’t tell anybody who has already looked in any depth at said phenomenon much they don’t already know. 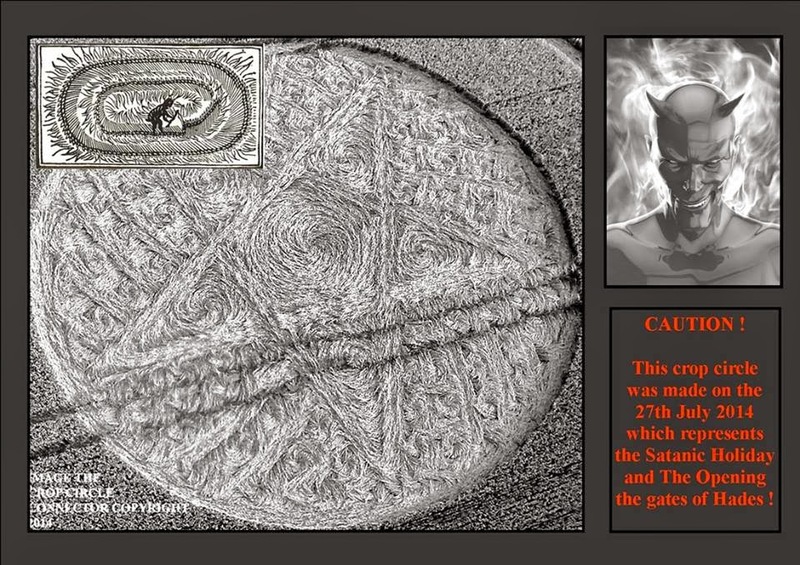 This entry was posted in Andrew Pyrka, Charles Mallett, Krsanna Duran, Report A Crop Circle Formation on October 15, 2014 by admin. Our favourite circle of the season, and one that we know was much-loved by many people. Yeah, right, Andrew, of course. Now go and take your meds. Ignoring the ring of code – which has yet to be deciphered – perhaps the most striking and innovative thing about this design is the fact that the pattern is entirely within the lay rather than the conventional ‘alternating standing and flattened bits’ style. Yes, there have been woven circles before – indeed there were other woven circles in 2014 – but Cherrington takes it to another level entirely. Though few people seemed to pick up on it when Cherrington appeared, there is one particular example we can think of where this has been done before. 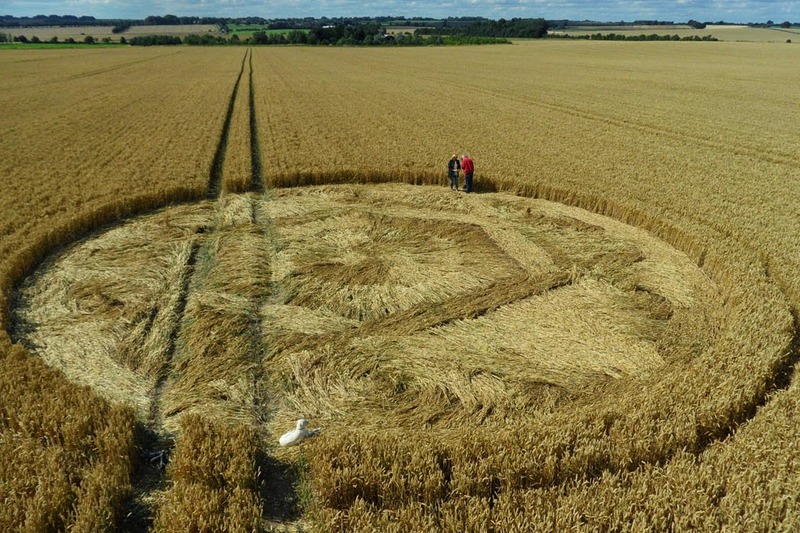 This circle appeared below the Hackpen Hill white horse in August 2013. From a distance it merely looks like a small and unremarkable ringed circle. Hackpen Hill, 11 August 2013. 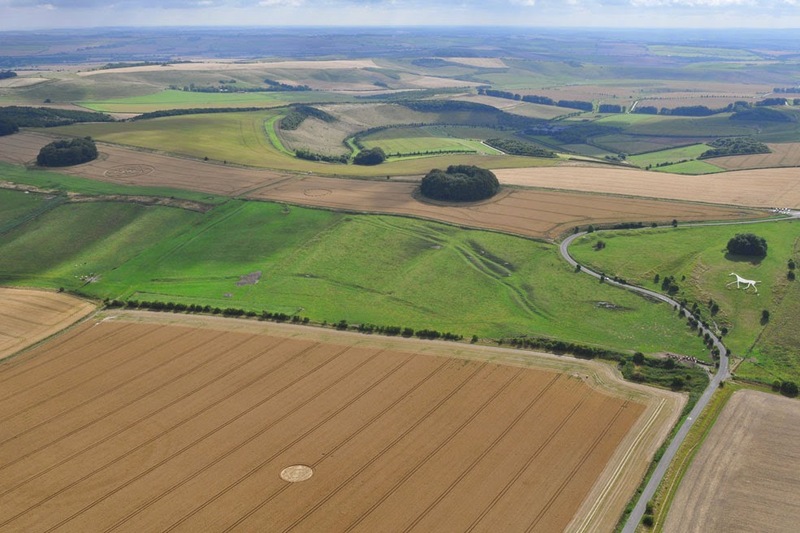 Note the white horse to the right in the photo above, and – just to the left of the circle – the ghost of the Hackpen Hill cubes formation of August 2012, which was in the same field. Hackpen Hill photos above and below by Janet Ossebaard. 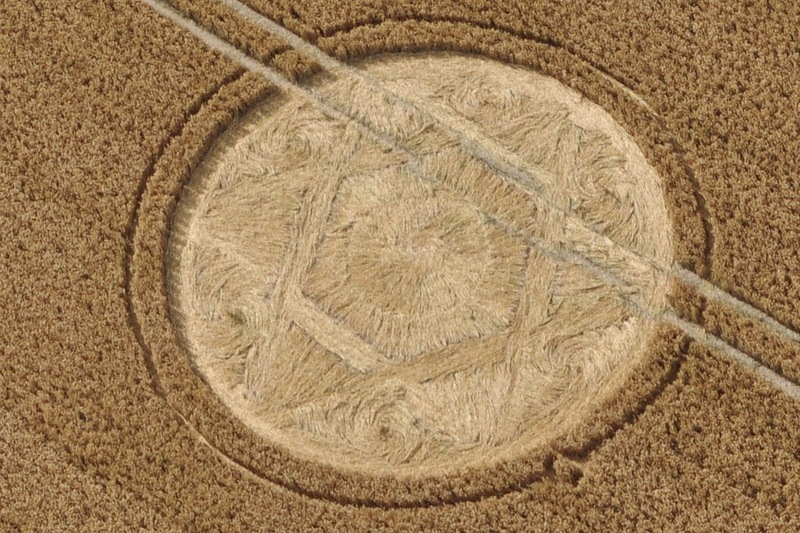 A closer look, however, reveals a striking hexagram lay. This was one of those circles which was for the most part neglected when it appeared, but which was loved by all who took the time to appreciate it, especially those who visited. Its qualities take effort on the part of the participant. 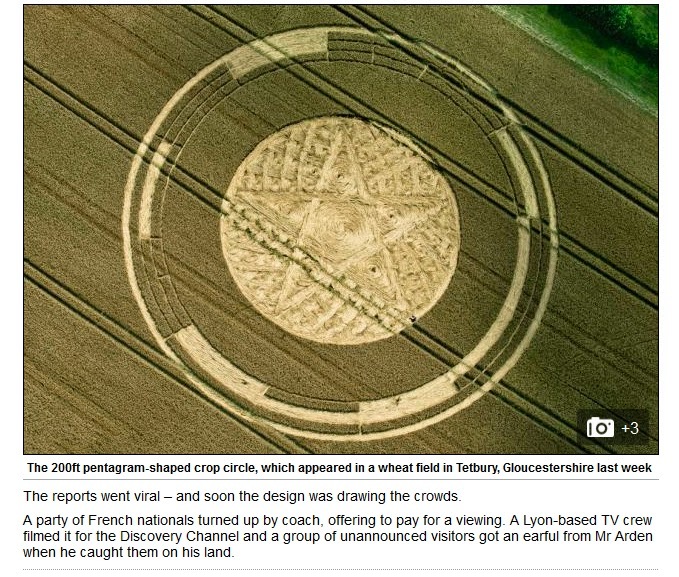 Perhaps that is the message of these two circles; get to know them, appreciate the detail, rather than just give the aerials a quick glance and a ‘yeah that’s nice’ or ‘fail’. 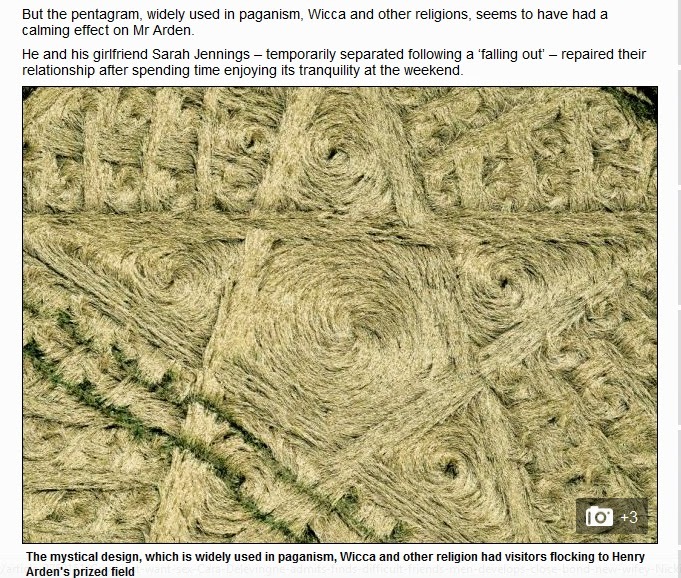 We’ve not seen anybody else link these two circles, though to our minds the relationship is obvious. Cherrington 2014 is Hackpen Hill 2013 taken to the next level. 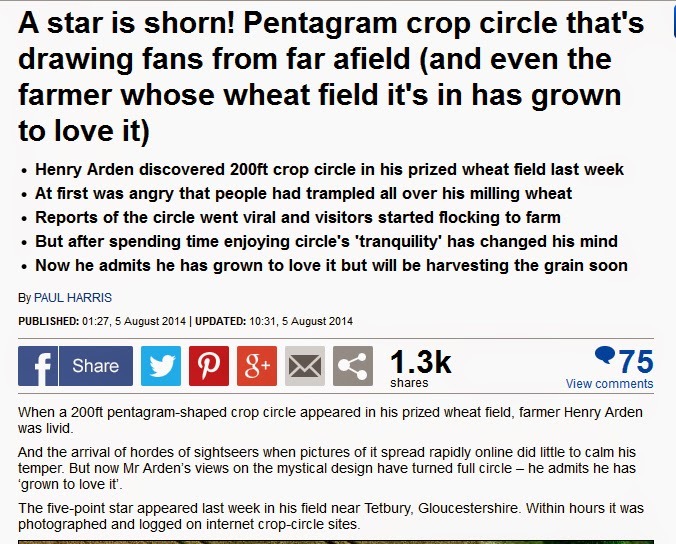 This entry was posted in 2012 Aug 26 Hackpen Hill, 2013 Aug 11 Hackpen Hill, 2013 Season, 2014 Jul 27 Cherrington, 2014 Season, Andrew Pyrka, Daily Mail, farmers, Report A Crop Circle Formation, seeing demons and satanic stuff everywhere on September 25, 2014 by poppy amersham.